Please let us know the product ID of the item that interests you. We will send a quote containing the price, stock status, and other important points. Please provide the official order. We will prepare to ship your order. Please transfer the designated amount of money in Japanese yen to our bank account. The bank transfer fees and charges for exchanging currency are the buyer’s responsibility. We will ship the products once we have confirmed the payment. *You can pay by PayPal if products that have PayPal mark. Actual pieces can be viewed at our gallery in Kobe. Please see the “Access Information.” Of course, you can purchase them on the spot. Please fill in an Inquiry Form for Mounting / Remounting or follow the procedures described below. Measure the length and width of the main work. Then, let us know the information about points 1 and 2 via the “Contact Us” form. Please contact us through our web site, and please tell us your requests. (For example, you want us to mount the work with yellow fabric.) We will provide a proposal that meets your needs, based on your budget and expressed preferences. If you send some pictures of your artwork, we will make a simulation of the finished form with Adobe Photoshop, for your approval in advance. We will send an estimate containing the cost, the delivery period, and other important points. Sometimes, we will ask some questions at that time. After your agreement, please provide the official order and send us the artwork. After the artwork arrives, we will do a final confirmation and send an official quotation. If you cancel the order, we will return the artwork. After your agreement, please transfer the designated amount of money, in Japanese yen, to our bank account. The bank transfer fees and charges for exchanging currency are the buyer’s responsibility. We will start to mount the artwork once we confirm the payment. We can not accept your cancel request after this. The manufacturing is already in process as scheduled. Since this work is solely made for you by your custom order, we can not accept cancellation. If you want to cancel, I’m afraid we are going to have to ask you for the cost spent for manufacturing. Thank you for your understanding in this issue. Please contact ART NOMURA for all your artwork-mounting needs. Please let us know your wish in as much detail as possible via the “Contact Us” form. We will send a reply email. We will do our best; however, please accept my apology when we are not able to help you. If there is no entry column for intermediary bank on the application form, please fill in the remarks column with “Bank of Tokyo-Mitsubishi, UFJ”, Ltd, Tokyo” with its SWIFT code# BOTKJPJT. Please fill out the form below and submit for your inquiry. ❈ is the mark for required item. Your privacy is important to us. We are committed to protecting your privacy. so the number of people from other countries who are interested in Japanese culture has been increasing. Japanese are closely related. We can see Japanese values through kakejiku. 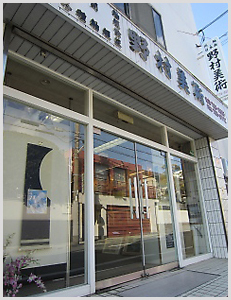 Art Nomura is an art dealer which produces kakejiku (hanging scrolls). We mount many paintings and calligraphic works in kakejiku in my factory. Kakejiku are our main product. We also remount and repair old or damaged kakejiku. We share the traditional Japanese art of kakejiku with people all over the world. Copyright © ART NOMURA All Rights Reserved.